Note: ARC received for free via NetGalley in exchange for an honest review. 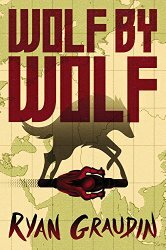 If you love alternate history WOLF BY WOLF is an engrossing swap as a young Jewish girl attempts to kill Hitler. But it's also so much more. I don't want to say that there's a strong focus on relationships yet that's really an important piece of what makes this such a good book. Yael's relationships with the people she has lost and those she is competing against play significant roles in who she is and what she is trying to do. While I felt that at times it was slow or that it cut off where more information would have been useful WBW was a really good read and one I think most of the target audience will find enjoyable. I'm looking forward to thrusting it on my own teenager to read.